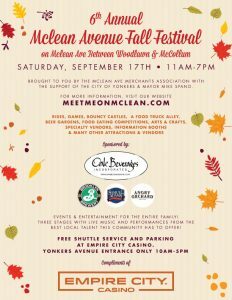 Suburbia Roller Derby will be representing Westchester County at the 6th Annual McLean Avenue Fall Festival on September 17th. We won’t have a booth but if you can find us you will win a free t-shirt (supplies limited)! Don’t forget to ask us about Tryouts on September 26 & 28th!